ww2dbaseAleksandr Mikhaylovich Vasilevsky was born in Novaya Golchikha, Kineshma Uyezd, Russia as the fourth of eight children of priest Mikhail Vasilevsky and Nadezhda Sokolova. In 1897, the poor Vasilevsky family moved to Novopokrovskoye, Russia, where Aleksandr Vasilevsky would later attend the school at Ascension Church. In 1909, he entered the Kostroma seminary. Upon completing his studies at Kostroma, he entertained the idea of becoming a farmer or a surveyor, but the outbreak of WW1 saw him taking another detour in his young career. 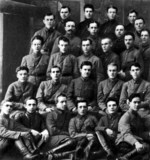 He enrolled at the Alexander Military Law Academy in Petrograd, Russia in Feb 1915 and was sent to a reserve unit in May 1915. He entered fighting in Sep 1915 with the 409th Novokhopersky Regiment of the 109th Division of the Russian 9th Army. In 1916, he reached the rank of captain and was commanding at a battalion level. He retired from the front in Dec 1917, returning home to be a drill instructor, and retiring from the military in Sep 1918. In Apr 1919, he was conscripted by the Soviet Red Army, serving as a reserve battalion commander by the end of the year. With the Red Army, he fought in the Polish-Soviet War of 1919-1921 and participated in the suppression of peasant uprisings in Byelorussia in the early 1920s. In the mid-1920s, after he had joined the Communist Party, he broke off contact with his religious parents over disagreements over religion. In 1928, he completed the Vystrel regimental commander's course and rose to regimental command by the end of the decade. In 1931, he was assigned to the Directorate of Military Training. In 1934, he became the Senior Military Training Supervisor of the Volga Military District. In Oct 1937, during Joseph Stalin's purge of the Soviet military, he was among those favored and was promoted to the General Staff. ww2dbaseIn 1939, Vasilevsky was made the deputy commander of the Operations Directorate of the General Staff. In this role, he participated in the Winter War from the rear and received further attention from Stalin; he received the Order of the Red Star for his service in the Winter War. In 1940, upon completion of the Winter War, Stalin suggested him to re-establish connections with his parents despite his father being a priest, a profession viewed with hostility by the Soviet government, so that he could provide support for his parents as it was his duty. In Aug 1941, after Germany had turned on the Soviet Union by launching Operation Barbarossa, he was made Chief of the Operations Directorate of the General Staff and Deputy Chief of the General Staff. As German troops neared Moscow, Russia, he personally inspected the defenses on the front lines to ensure that supplies and reinforcements were reaching locations where they were needed, and then went on to plan the counteroffensive that drove German forces away from the Soviet capital. In May 1942, during the Second Battle of Kharkov, the Soviet forces suffered a major defeat, and part of the blame fell on his shoulders for abiding by Stalin's orders without exercising his better judgment as a military commander. On 26 Jun 1942, he was named the Chief of the General Staff of the Soviet armed forces. In the following month, he was sent to Stalingrad in southern Russia as a representative of the Stavka, where Aleksandr Vasilevsky and Georgy Zhukov developed a plan which led to the Soviet victory. His successes at Stalingrad led to his promotion to the rank of General of the Army in Jan 1943 and Marshal of the Soviet Union in Feb 1943. He coordinated the actions of the Voronezh Front and the Steppe Front during the Battle of Kursk in Jul 1943, and executed follow-up offensives after the Kursk actions. In late 1943, he was shifted to Ukraine where he would enjoy continued success against Axis forces. In May 1944, he was wounded in Sevastopol, Ukraine as his vehicle drove over a mine, but he quickly recovered, returning to the front to participate in Operation Bagration. In Feb 1945, he was relieved of his duty as the Chief of the General Staff of the Soviet armed forces to lead the Soviet 3rd Byelorussian Front during the offensive into the East Prussia region of Germany; in this role, he negotiated with German General Otto Lasch for the surrender of Königsberg. During his service in the European War, he was awarded the Order of Victory twice and was named a Hero of the Soviet Union. ww2dbaseAs early as 1944, Vasilevsky was already named as the one who would lead all Soviet forces in Asia when the Soviet Union would turn on Japan. He began planning for such an offensive in late 1944, which was approved by Stalin in Jun 1945. On 9 Aug 1945, the Soviet Union turned on Japan, with whom the Soviet Union had an effective non-aggression pact in place, and the offensive overwhelmed the Japanese forces in northeastern China. 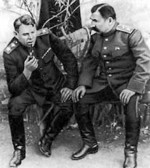 Vasilevsky was awarded the second Hero of the Soviet Union for this success. ww2dbaseAfter WW2, Vasilevsky resumed his role as the Chief of the General Staff of the Soviet armed forces. Between 1949 and 1953, he was the Minister of Defense of the Soviet Union. He was not only among Stalin's most able but also most trusted military commanders, thus after Stalin's death in 1953, Vasilevsky soon fell out of favor. He was demoted to Deputy Minister of Defense then Chief of Military Science in the ministry, then was forced into effective retirement in 1957. In 1959, he was given the honorary position of the General Inspector of the Ministry of Defense. In 1973, he published his memoirs under the title of The Matter of My Whole Life, in which he never mentioned his awards despite being among the most decorated Soviet officers. He passed away in 1977 and his ashes were placed in the Kremlin Wall Necropolis. 30 Sep 1895 Aleksandr Vasilevsky was born in Novaya Golchikha, Kineshma Uyezd, Russia; his birth was also recorded as 18 Sep 1895 in the old style. 28 Oct 1941 Aleksandr Vasilevsky was promoted to the rank of lieutenant general. 29 Oct 1941 Aleksandr Vasilevsky was slightly wounded by a German bomb while working at his office in Moscow, Russia. 4 Dec 1941 At an event at the Kremlin in Moscow, Russia, Joseph Stalin noted to Aleksandr Vasilevsky his surprise that Vasilevsky only had a single Order of the Red Star and a medal on Vasilevsky's uniform; the Soviet leader had expected the general to be better decorated. 24 Apr 1942 Aleksandr Vasilevsky was named the acting Chief of Staff as his superior Boris Shaposhnikov had fallen ill.
26 Apr 1942 Aleksandr Vasilevsky was promoted to the rank of colonel general. 21 May 1942 Aleksandr Vasilevsky was awarded the Order of Lenin for the first time. 26 Jun 1942 Aleksandr Vasilevsky was named the Chief of the General Staff of the Soviet armed forces. 23 Jul 1942 Aleksandr Vasilevsky was named a representative of the Soviet Stavka at Stalingrad, Russia. 9 Dec 1942 Aleksandr Vasilevsky and Georgy Zhukov presented to Joseph Stalin a plan for a counteroffensive at Stalingrad, Russia. 28 Jan 1943 Aleksandr Vasilevsky was awarded the Order of Suvorov 1st Class. 16 Feb 1943 Aleksandr Vasilevsky was promoted to the rank of the Marshal of the Soviet Union. 10 Apr 1944 Aleksandr Vasilevsky was awarded the Order of Victory for the first time. 10 May 1944 Aleksandr Vasilevsky was wounded in the head at Sevastopol, Russia after his car drove over a mine and was evacuated to Moscow, Russia for treatment. 29 Jul 1944 Aleksandr Vasilevsky was made a Hero of the Soviet Union and was awarded his second Order of Lenin. 3 Nov 1944 Aleksandr Vasilevsky was awarded the Order of Red Banner for the first time. 21 Feb 1945 Aleksandr Vasilevsky was awarded the Order of Lenin for the third time. 19 Apr 1945 Aleksandr Vasilevsky was awarded the Order of Victory for the second time. 27 Apr 1945 Aleksandr Vasilevsky began planning for the Manchurian Strategic Offensive Operation. 8 Sep 1945 Aleksandr Vasilevsky was made a Hero of the Soviet Union for the second time. 29 Sep 1945 Aleksandr Vasilevsky was awarded the Order of Lenin for the fourth time. 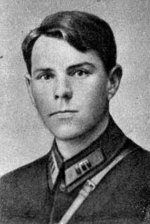 20 Jun 1949 Aleksandr Vasilevsky was awarded the Order of Red Banner for the second time. 29 Sep 1955 Aleksandr Vasilevsky was awarded the Order of Lenin for the fifth time. 29 Sep 1965 Aleksandr Vasilevsky was awarded the Order of the October Revolution. 22 Feb 1968 Aleksandr Vasilevsky was awarded the Order of Lenin for the sixth time. 29 Sep 1970 Aleksandr Vasilevsky was awarded the Order of Lenin for the seventh time. 30 Apr 1975 Aleksandr Vasilevsky was awarded the Order for Service to the Homeland in the Armed Forces of the Soviet Union 3rd Class. 5 Dec 1977 Aleksandr Vasilevsky passed away in Moscow, Russia. I recently discovered that Aleksandr Vasilsky is my grandfather’s brother. We know nothing of this side of our family. I am trying to find his memoir in English if possible. Any help will be appreciated. This is literally the only page I could find that sells the book. Only few other websites even mention its existence. I'm also not sure if its real or not but I guess you could try.